Marine Aquaria have been specifically related to fresh water tropical conditions, they are, however, totally unsuitable containers for sea water. Because sea water has a strong corrosive action on metal, marine aquaria should ideally be made entirely of glass, or plastics. Unfortunately, glass tanks of the size required, and with glass fronts free from imperfections caused during moulding, are not readily available. Moulded glass-fibre tanks are becoming available, but they are expensive. 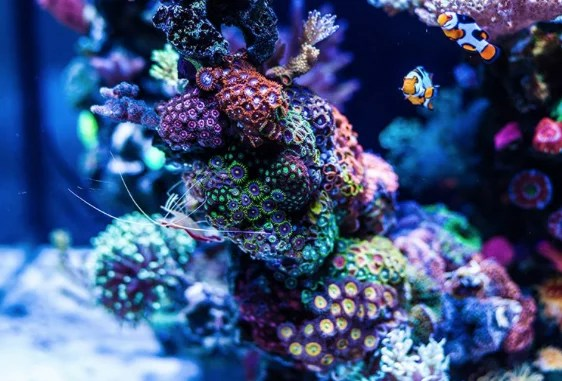 Tanks made from wood have been made by keen aquarists for a considerable number of years, and there are some advantages to be gained from this type of construction, but the most practical is still the standard metal frame, glazed with plate glass. Naturally the frame has to be made from a corrosion-proof metal, or has to be suitably protected, and it is possible to obtain tanks with nylon-coated frames, or frames covered with some other suitable plastic. Tanks manufactured from Plexiglas are also quite suitable except that the material scratches rather easily. For tanks holding over ten gallons of water, the thickness should be \ in .—anything thinner than this will bow in the course of time owing to the pressure of water, and when setting up the tank the whole area of the base must be supported. On the other hand, Plexiglas does not discolour like most clear plastics and requires little or no maintenance. Cements are important, they should be non-toxic and if possible should not be allowed any contact with the water. If a seam of cement is visible at the glass joints, it is advisable to cover the joint with liquid plastic, black asphaltum varnish, or aqua-scaler. It may be useful on occasions to use an aquarium that was originally designed for freshwater. This can be done if the seams, any exposed metal, and the underside of the top of the frame is protected with black asphaltum varnish, or some other suitable insulant. The aquarium should be thoroughly cleaned and disinfected before it is finally filled. Wash the inside thoroughly with clean water, never use soap or any detergents, and then rub the inside with a damp cloth that has been dabbed in table salt. Wash again, and disinfect with a weak solution of permanganate of potash or, if you prefer, wipe the inside of the tank with methylated spirits, having first dried the interior. Make certain that the underside of the frame and all corners and seams have been fully treated. If you have chosen a metal-framed tank, fill it with fresh water for a few days. The water pressure will cause the cement to thin a little between the glass and frame, and will expose a wider seam inside. Empty the tank by siphoning off, dry the interior and treat the seam with a scaler. The tank is now ready for siting. Choose the position with some care as once the tank is set up it should not be moved. An ideal position would be near a window facing south, the amount of sunlight falling on to the tank could then be controlled by blinds or by shading with curtains, but if such a position is not available, then try to site the tank where the rays of the sun will fall on to the tank for a period during the day. It may well happen that it is impossible to satisfy either of these suggestions. If this is so, then artificial light will have to be relied upon.